Here is a vacation dream home come true. Tucked into the rugged terrain of the beautiful indian bluff, this 3-story oak log lodge of open log beam construction features Southwestern decor, leather couches, 2 massive native rock fireplaces, trophy mounted wildlife and an open log staircase. Most of the 9 bedrooms are 2-story with a king or queen log bed and 1 or more bunks in the upstairs loft. The kitchen is fully equipped and includes a double convection oven, 2 microwaves, 2 dishwashers, 2 refrigerators and a full freezer in the large pantry. There are 3 living areas, a front porch with rocking chairs, a covered back deck with picnic tables, large charcoal grills, several washer/dryers, 2 TV/VCRs. 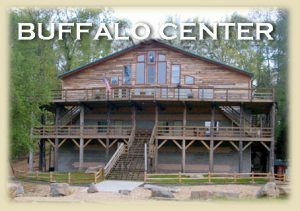 Built on top of a towering bluff in the natural Arkansas forest and overlooking Big Creek, this three-story log lodge is a favorite because it is located next to a natural swim hole as well as the recreation field. The large deck with picnic tables is a great place to eat and enjoy the view. 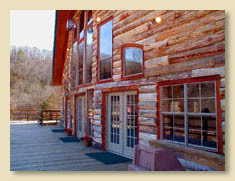 Inside you’ll find open log beam construction, wood floors, bright quilts and handmade log king or queen beds. This lodge has 7 private bedrooms, 7 bathrooms, a large bunkroom and 3 lofts. Special amenities include 2 massive stone fireplaces, a ping-pong table, TV/VCR, 2 refrigerator/freezers, several washer/dryers and large charcoal grills. 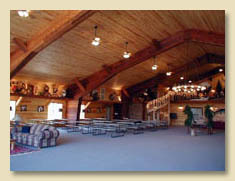 Rugged Western decor, vaulted ceilings and breathtaking view make this new 4-level Lodge perfect for a mid-sized group. There are 5 bedrooms/baths furnished with luxurious King or Queen beds and as a bonus, hideaway nooks and lofts for the children. A small bunkroom with washbasin is an additional sleeping area. The kitchen is fully equipped with all the conveniences including 2 stoves/ovens, 2 microwaves, 2 dishwashers, refrigerator, freezer, serving bar and large oak dining table. The Great Room with wood-burning fireplace is designed for just relaxing or for group meetings. Other amenities include 2 washer/dryers, large deck with picnic tables, 2 large charcoal grills, a TV/VCR (videos only) and a separate deck outside the Master Bedroom. 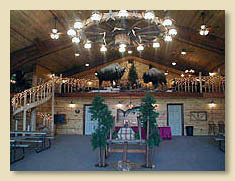 Nestled among the trees on the edge of a meadow, this log lodge is ideal for small groups or families. It features open log lodge construction, wood floors, a massive stone fireplace, 2 private bedrooms and a bunkroom that kids love because they climb down a ladder from the great room (there is a lower level door from the outside if preferred). There is a fully equipped kitchen and a meeting room. Also included are large charcoal grills and a washer/dryer. Enjoy the beautiful outdoors on the covered wraparound deck or in the porch swing under a tree. This cozy cabin in the woods is a favorite with families and features country decor, hardwood floors and a covered porch with rocking chairs. It is close to a natural swim hole with a rope swing in the crystal-clear creek. Three bedrooms feature queen beds (The master has 2) and the fourth bedroom has 2 bunks. The full kitchen includes a microwave, dishwasher, pantry and a closet with washer and dryer.